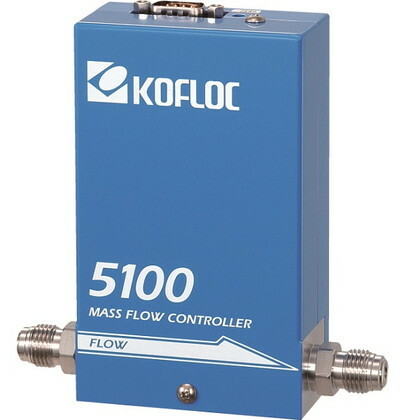 Model 5100 Series Mass Flow Controller/Meter features weldless structure, metal seals, accurac y of ≤±1%, re-sponse of ≤±1 second and other basic performance con-ditions required for semiconductor process control, and additionally, has achieved a significant price reduction. ・ High accuracy and high response are achieved by the flow sen-sor with temperature-following current difference detection. ・ A normally-closed solenoid valve is employed. ・ A low leak rate is achieved by the weldless structure and metalseal. ・ The dead volume is reduced thanks to the diaphragm seat valve. ・ The face-to-face and body dimensions and the wiring tie-inpoints are designed to facilitate replacement of devices made by other companies.